We traveled over a long weekend for some family stuff, so I’m feeling off kilter a bit. It’s amazing how much disrupting routine makes my head spin. I always return to my home and desk at work thinking “what was I doing again?” I have every confidence I will walk into my cubicle today and forget exactly what I do at my job. So until I can get my head together on what we got in our CSA last week, let’s just chat. Week 4 of training for the Pittsburgh Half brought 20.15 miles. Even though I didn’t technically have a “long” run this week due to my schedule, I managed two difficult workouts. Tuesday was my first time doing 800 repeats with my running group – on hills, nonetheless. I liked it for a speed workout and it definitely took effort to keep the pacing right. But it’s clear that my fast is getting faster and my slow is getting faster. And I’m happy with that. The other difficult workout was in the hotel gym this weekend. 4 miles on a treadmill already approaches my personal treadmill limit, but the room was sweltering (literally 76 degrees) and my body was aching from all of the physical work I was doing over the weekend. It was at my “easy” pace, but nothing about it felt easy. But it got done. Which is exactly how I’m going to get to my goal. 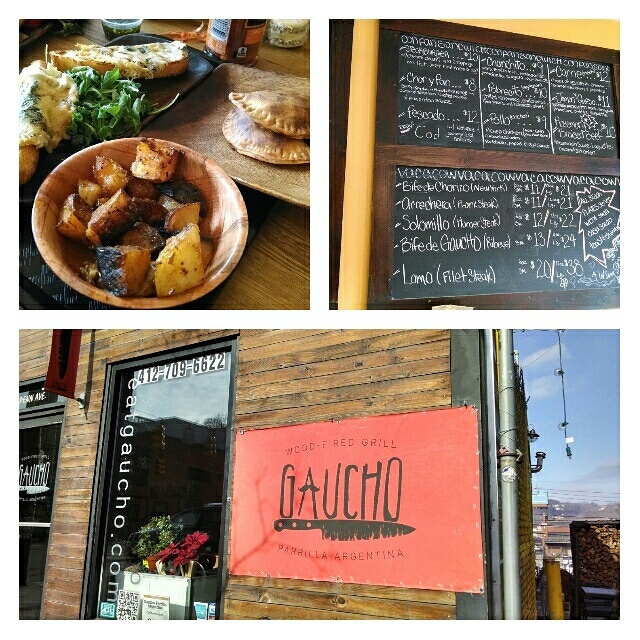 Definitely the best eating experience this week was going to lunch at Gaucho on Friday before we left town. I’ve wanted to eat there since we had a taste of their food at the Backyard BBQ even this summer. 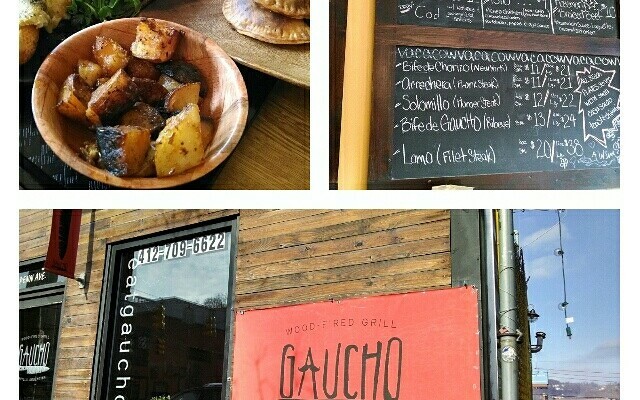 It’s Argentinian food, wood-fired. And so delicious. I could never be a restaurant critic because I have very few words in my vocabulary for delicious food besides “so good” and “amazeballs” and some various grunts and groans. But all of these apply at Gaucho. So that kombucha restart? Molded AGAIN. I have no idea what’s going on, so I need to do some extensive troubleshooting and break out the thermometers and whatnot. Maybe our house is just too cold right now for it? I’m not going to raise the heat in the house just to brew some kombucha, since that’s not remotely cost-effective. But still, frustration! Also in homesteading this week? Shoveling snow. Hurrah! With virtually no time in the last four days to read, I’m still reading what I was reading last week. But when we travel in the car, we typically listen to an audiobook. We picked The Hitchhiker’s Guide to the Galaxy by Douglas Adams, which is apparently something I needed to consume if I was going to keep my geek street cred. What a great choice for an audiobook – the humor is especially funny when narrated by a great British reader. Happy to have had a push to start it! Not going to lie. Every time we get significant snowfall, I wish we got enough to get truly snowed in, like we did back in 2010 (?). Because I’d rather have a ton of snow, or no snow at all. 6 inches at a time just makes my commute a mess. I know that big blizzards like the one hitting the east coast aren’t really a good thing – but from this chair at 5:31 a.m., I’m thinking being snowed in sounds pretty good. Have you ever found something new and then wondered where it had been all your life? Like it was something you were secretly looking for? That happens to me all the time because, let’s face it, I’m a voracious consumer of information. I’m always reading or watching or listening to something to feed my desire for learning. Particularly about food. Because I’m a voracious consumer of that, too. And my love of good food even predates my love of healthy and sustainable/just food. I started to consider myself a foodie when I learned to cook and then subsequently learned that I love it. So when I stumbled across an article somewhere that mentioned a new podcast about food called Gastropod, I had to check it out. I got used to listening to spoken word programs by listening to NPR on my commutes several years ago. When I transitioned back to driving instead of taking the bus for my current job, I learned to use the time in the car for audiobooks, so that I could increase my book consumption. But podcasts never floated my boat, partially because all my electronics are Android/non-Apple and always associated iTunes with podcasts. Plus, the few podcasts I had tried were just boring. Bad narrators/hosts, people who couldn’t translate their love of the subject matter to others, and just boring info in general. But I’m cooking some dinner last night, and instead of watching a TV show, I decided to listen to Gastropod. And holy buckets, am I glad I did. It was awesome. If you love food, and you don’t mind listening to people talk as a form of consuming information, you will love this. Co-hosts Cynthia Graber and Nicola Twilley serve up a brand new episode every month, plus a bite-sized interlude and articles to tide you over in between. Each episode, we look at the hidden history and surprising science behind a different food and/or farming-related topic, from aquaculture to ancient feasts, from cutlery to chile peppers, and from microbes to Malbec. We interview experts, visit labs, fields, and archaeological digs, and generally have lots of fun while discovering new ways to understand the world through food. We think these stories are fascinating, and we hope you will too. In between, we catch up on the news that caught our attention and the places and ideas we’ve been thinking about: these snack-size podcasts are a quick hit of brain candy to keep you going through the month, until our next full episode is ready. The co-hosts, or narrators or what have you, are SO good at this. You’d think this podcast has been around forever, because it feels like they already worked the kinks out. Their voices are easy to listen to and have that soothing effect that many NPR people have – the one that calms me in rush hour. Though I think it was fitting to listen to this podcast not in my car, but at my kitchen counter, chopping onions and garlic for the venison stew I was making. So far, they have two full episodes and two bite-sized ones. The first episode was about considering how the utensils we eat with affect taste. (Apparently gold utensils are where it’s at? I’ll get right on that.) Some interesting people were interviewed, including Bee Wilson, the author of a book called Consider the Fork that is now on my TBR list. The second full episode interviewed Dan Barber, author of The Third Plate. (Which if you recall, I loved.) Even though I’ve already read the book, the episode was still engaging and interesting, with some new information. Plus, who can’t get swept up when Barber talks about the Dehesa? You can access Gastropod it on iTunes, or if you’re an Android person, you can use SoundCloud, like I did. Sign up for emails on their website that will alert you when a new episode is live.